Training a bloodhound is not that different to training a regular dog. However, you need to be more patient because they are naturally clumsy animals and a bit slow when it comes to obedience. They are very emotional animals and respond best to cajoling as opposed to someone barking direct orders at them during training. They love affection and praise and using this a ploy will help you to get your training methods across. The first day of training will involve playing with your dog with a rubber ball or golf ball. Teach the dog to play pitch and “fetch”. Get him to experience this as a fun game. This process teaches him to retrieve things and get used to the tedium of the game. On the third day you should introduce someone else into the training. Get the dog used to the scent of your partner and ask them to participate in a game of hide and seek. Get the bloodhound to use the scent of your partner to find them in a hiding place nearby. Repeat this task giving the bloodhound items of clothing which your partner wore to sniff. Continue this task for a couple of days each time moving the hiding place a little further away until finally the search is being accomplished within a block or more. Now you should have the bloodhound finding your partner on a regular basis within a block or so. This best place to perform this training is in a field or country setting. Take an item of your partners clothing with you for this training. Let your partner get out of your vehicle and run about a half of mile into the woods to hide. 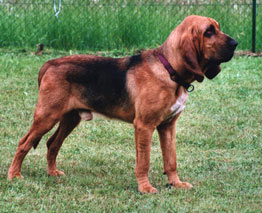 Take the clothing you brought with you and let the bloodhound smell the scent and go with him to find your partner. Remember this is a game to the bloodhound so you want him to be enthusiastic. Each time he finds your partner give him a treat and a lot of love. This will encourage him to keep repeating this task. After a short time your bloodhound will be able to find your partner wherever he goes as long as there is a scent to be picked up by your bloodhound.